EYE REJUVENATION OPTIONS IN HARLEY STREET LONDON. The eyes are often the immediate focus when two people meet for the first time. But as we get older, gravity begins to take over, and our eyelids start to droop. Most clients want more youthful eyes without having to undergo a surgical procedure such as eyelid surgery. Thanks to anti-aging treatments, your clients can have non-surgical eye rejuvenation and eliminate the risk surgery normally entails. Botox for crow’s feet and brow lines. Over time, the creases caused by frowning, smiling and squinting can leave wrinkles. Once injected, Botox injections reduce muscle contractions in the treated areas. It also has been successful in treating wrinkles between the eyebrows. 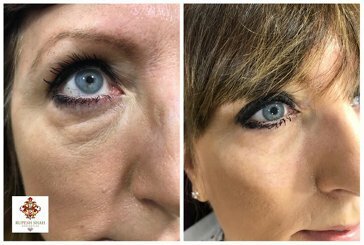 Dermal fillers for dark circles and under eye bags. As we age, the natural fat in the face decreases and leads to an increase in lines and wrinkles. Hyaluronic acid-based injectable fillers can correct smile lines and add volume to cheeks. It’s an excellent option for clients who wish to achieve a lower eye lift without surgery. Fillers can correct under eye bags and dark circles under the eyes. A brow lift, also known as a forehead lift, smooths and lifts the brow area, which helps clients look more alert and youthful.